Worst Personalization Ever? It Could Happen To You, TTM Baseball Collectors! This cautionary tale comes courtesy of Canadian collector Tony O’Neill. Before you glance at the picture and say, “But I don’t collect hockey,” read this one closely and be warned. “On a similar note, sometimes this happens with mail requests. That is the reason for this email. I want to share with you what happened to a collector on a forum I regularly visit. Although I don’t know him personally, I have “talked” to him through the board and by email and have helped him out for photo requests for players. 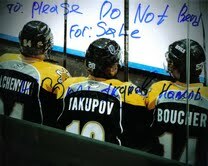 It is almost exclusively hockey requests, but as you realize, it’s the same as requesting any athlete’s autograph. This collector genuinely loves his hobby, he makes his own custom photos with the team logo, and also collects multi-signed items like team photos, photos with more than one player featured etc. Recently he sent a request to a player on one of the minor league hockey teams. He sent two photos and received them back. The player, being Russian I assume, must have some preconceived ideas about TTM collectors. Or maybe the other players were giving him warnings about eBay dealers, I don’t know. Regardless, as you can see from the scans from this collector, the photos were ruined. The collector was so mad and upset, he ended up throwing them in the garbage, but not before scanning them first luckily. I am extremely sorry this happened. Nail (Yakupov, the player) takes his fan mail home and then just brings it back sealed ready to send out. I have addressed this with his representative. I will make sure we get something sent back out to you. I’m grateful for Tony’s input. Realize this radical responder was just a minor leaguer, not an NHL star. Such stunts could occur at any level of pro baseball. Baseball players may copy these TTM temper tantrums soon. As Tony’s helpful tale illustrates, be ready to contact a team front office (or even a league commissioner) to complain. Silence will serve no one. Coming Wednesday: The ultimate reply to bullying behavior from abusive autograph signers. Just wanted to update on this player….his name is Nail Yakupov and he was recently selected number one overall in the 2012 NHL entry draft by the Edmonton Oilers and is currently a rookie. Anyways, he is indeed Russian and probably was new to TTM at the time of this. So he did learn at least. Not bad….and much better than the fellows who ask for $ in order to sign. I don’t like that, they don’t have to sign and can just return it but asking for $ from fans who made your living seems a bit rude .